Your bathroom is your oasis. Given the choice, this is a space we all want to enjoy a luxurious setting to help us unwind. While I’m sure we’d all love to have a full size Jacuzzi bath, waterfall shower, sauna and maybe even an inbuilt (waterproof) media system, most of us will either lack the space or the funds for such extravagance. However, if you only have a small space in which to play with, don’t worry! To make the most of your small, but perfectly formed bathroom we would recommend picking a theme to make it stylish and fresh. Not only will it improve your home appeal, but it is likely to add some value and of course, improve your quality of life (unwind time!). Here are some of our favourite décor ideas around nautical, modern and classic British styles. 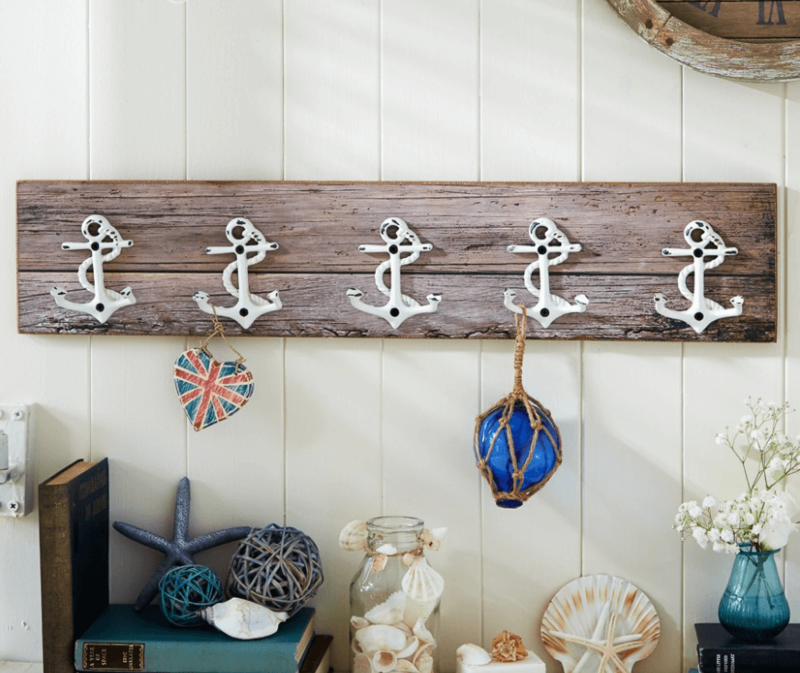 If you can get hold of some reclaimed or old wood, these anchor style hooks (£38.00) will be a perfect nautical match for hanging up towels – we love it. 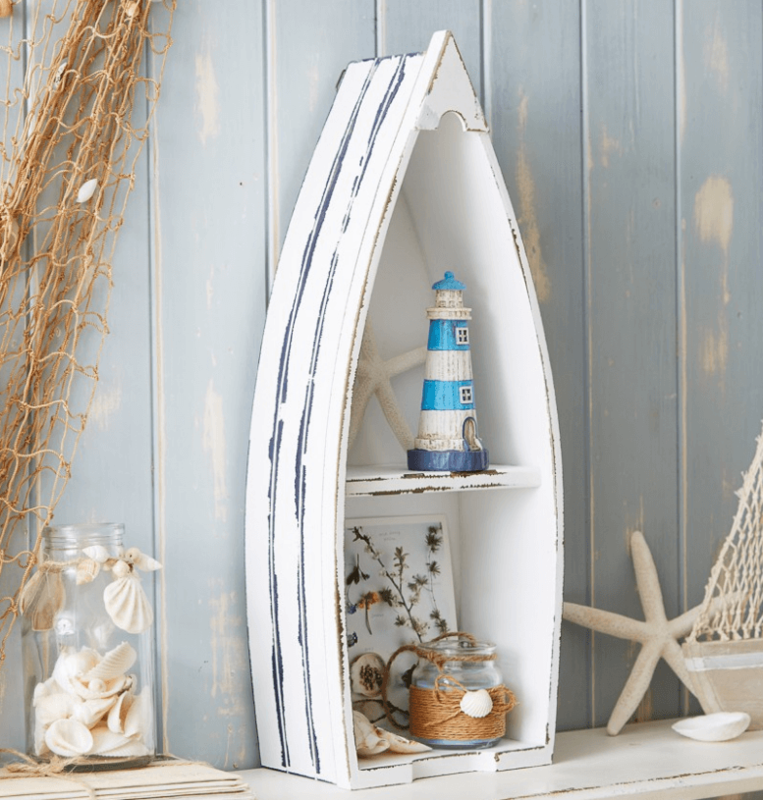 To add a small feature piece, why not store a couple of your bathroom products in this distressed wooden boat which can be wall hung or put on a shelf for £18.95. 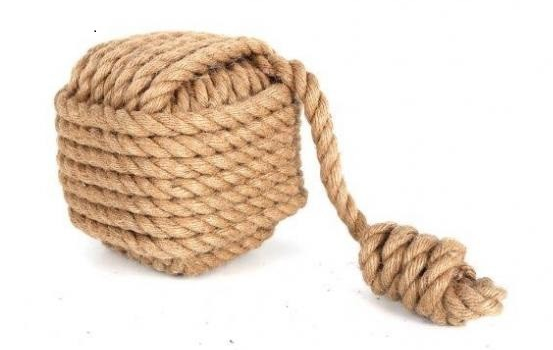 Top the bathroom off with this fun square rope door stop for just £9.95. If you have a cat, then this door stop may not stay put… but we think it’s a great way to finish the room. Ikea is a great place to find well-priced minimalist designs. 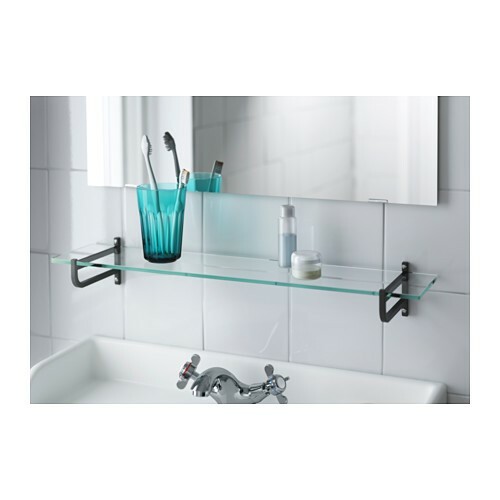 Add this glass shelf for just £12 to your bathroom; the tempered glass has high impact resistance and load bearing capacity. 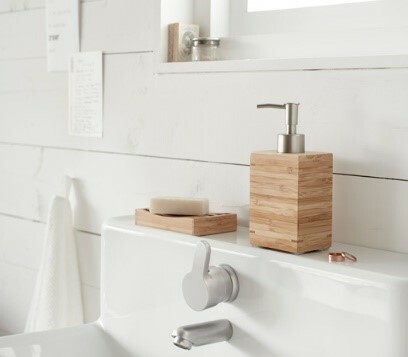 These bamboo bathroom accessories also from Ikea are only £11 for the pair. 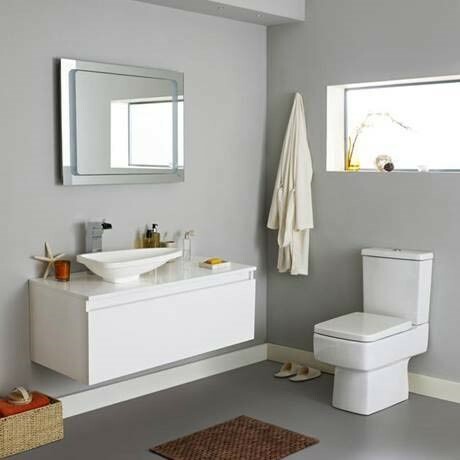 The clean lines and neutral colours should go with any modern bathroom. For an upmarket and subtle addition, try a backlit and demisting mirror. Mirrors with added tech are becoming increasingly available with a few ‘smart mirrors’ already integrating TV, apps and news and weather reports. We think this Hudson Reed mirror at just over £100 is modern enough to achieve the minimalist look and feel little high tech, without breaking the bank. A motion sensor will switch on the backlighting keeping your hands free and will probably surprise any guests! 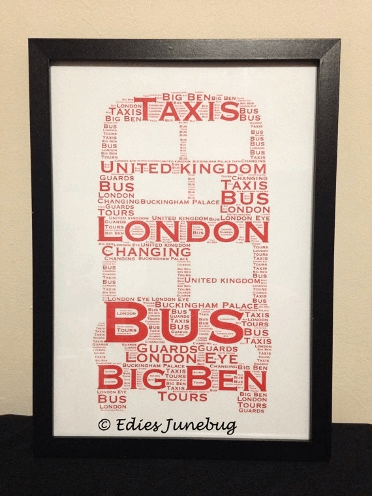 Union Jacks can feel a little overpowering, but this London bus art by Edies Junebug on Etsy has a more neutral British feel to it. It can be yours for £12 in an A4 size including frame. This John Lewis Water Hyacinth Magazine Rack for £25 will never go out of style. 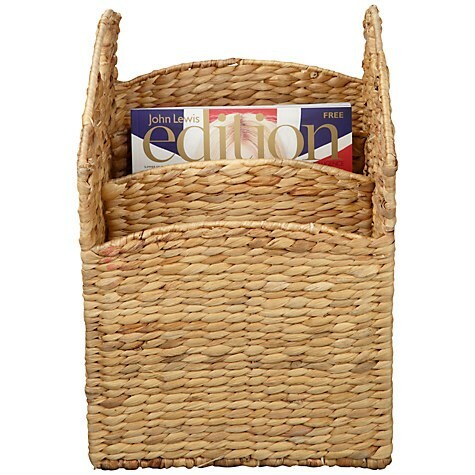 Made with woven water hyacinth this attractive, trunk shaped magazine holder adds a natural touch. It has two handles and three compartments for your magazines or books. Which leads us on to our next suggestion. We cheated slightly here as bamboo isn’t British, but it’s from John Lewis and it looks great. 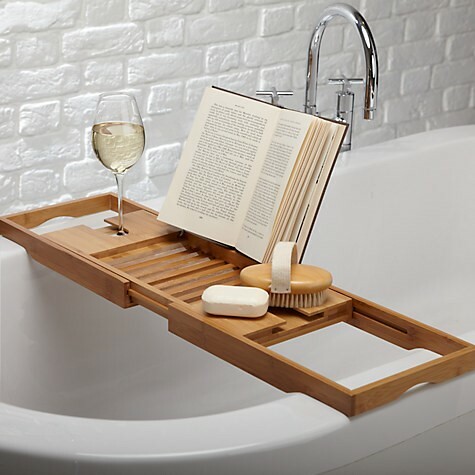 Get this rubberised bath bridge rack for £28 to extend you bath times with a chilled glass of wine, your favourite book or anything else you might need! Remember what we said about Jacuzzi ‘s and media systems? Well, hold that thought, because there might be some alternatives which can get you similar results for a fraction of the cost and space! Listen to your music via any Bluetooth device (smartphone) easily over the sound of the shower. Bluetooth speakers have come a long way in the last 5 years in terms of cost and performance. This JBL Flip 3 is splash proof, has a 10-hour battery life and gets a full 5/5 stars from What Hi Fi? Shop around and you can get one for around £55 and they come in range of colours to suit any bathroom. 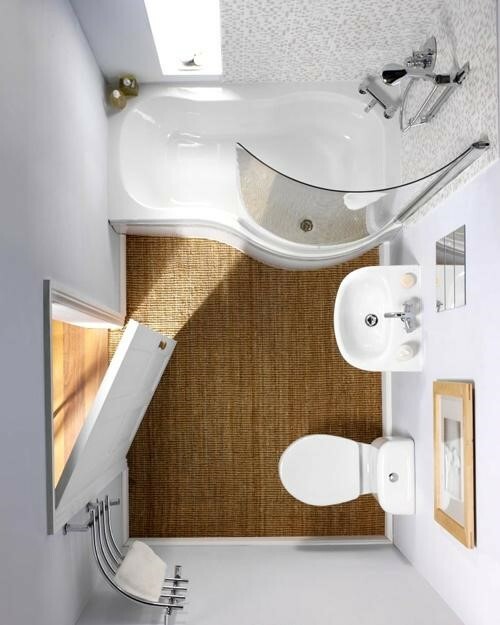 Okay, this might have been slightly obvious, but this image really makes a point on how you can squeeze a two in one shower bath combo in the right size bathroom. If your budget stretches you could get a Jacuzzi bubble feature but, we thought the option of a shower or bath in a small room would be enough of a selling point here. Opt for one which has a bulge in the shower end and this won’t feel like a cramped shower compromise which you often get in rectangular tubs. Hopefully, with our three theme suggestions, Bluetooth speaker and bath/shower combo we’ve shown you really can squeeze luxury and style into a small space. Keep this in mind next time you renovate or see a new property with a small bathroom; with the right furnishings and accessories you can turn a small bathroom into a tranquil and stylish space- even on a small budget. Want to find out more about upgrading your home on a budget? Check out our 6 cheap and chic ways to upgrade your kitchen!